At KEDPLASMA, our donors truly “Keep Life Flowing”. The plasma they selflessly give is used in a wide range of therapies that saves lives – the lives, most often, of total strangers. What greater gift could one person give another? Human plasma is unique and invaluable. Most of the plasma components used in these therapies cannot be obtained anywhere else; nor can they be replicated in a laboratory. A single plasma donation could save the lives of as many as 40 babies. It might provide vital treatment for burn and shock victims, cancer patients, donor organ recipients and others with compromised immune systems. 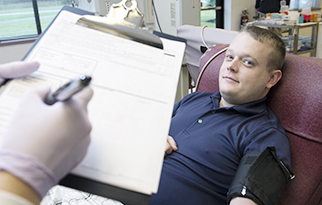 Clotting factors derived from donated plasma allow people with bleeding disorders (e.g., hemophilia) to live more normal lives. For more than 35 years, Somerset Laboratories, a subsidiary of Kedrion Biopharma, located in Williamsville, NY, has collected Anti-D plasma for lifesaving therapies. Each plasma donation can save the lives of as many as 40 babies. Prior to the use of Anti-D plasma therapies in 1968, approximately 10,000 babies died annually in the U.S. Today, it is almost totally preventable and deaths are exceedingly rare. WHAT DO WE DO WITH THE PLASMA? Plasma is the raw material from which Kedrion Biopharma derives further products. After collection, plasma is quickly frozen so it can be safely stored until it is separated into its various components in a process called fractionation. Kedrion has fractionation plants in Melville, New York, Bolognana, Italy, and Gödöllő, Hungary. The isolated proteins are refined and processed to create a number of plasma-derivative therapies – therapies based on clotting factors, albumin and immunoglobulin - that save lives and enhance quality of life for people suffering from a range of rare conditions like hemophilia and immune deficiency disorders. As more and more individuals benefit from treatment with plasma therapies, the demand for additional plasma is always increasing. At KEDPLASMAwe are proud to work with our generous donors, who make it possible for us to develop and create specialized protein therapies and distribute them in more than 90 countries to Keep Life Flowing. Because plasma is such a precious resource and because we know that giving takes both time and effort, donors in the United States are compensated for their time and efforts.